Vulnerability scanning is a crucial phase of a penetration test. Having an updated vulnerability scanner in your security toolkit can often make a real difference by allowing you to spot overlooked vulnerable elements. For this reason, the latest and newly released OpenVAS tool and libraries for Kali Linux have been manually packaged. How to install OpenVas on Kali Linux will be demonstrated below. Unless you have already done so, make sure that the Kali Linux is up to date and install the latest OpenVAS. When finished, run the openvas-setup command to configure OpenVAS. You automatically download the latest rules, create admin users, and start the various services. Depending on bandwidth and computer resources, this may take a while. [i] This script synchronizes an NVT collection with the 'OpenVAS NVT Feed'. 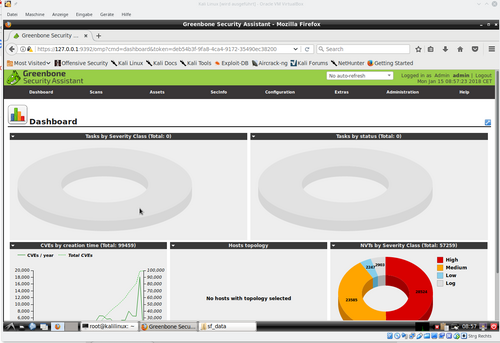 Restarting Greenbone Security Assistant: gsad. User created with password '6062d074-0a4c-4de1-a26a-5f9f055b7c88'. Once OpenVAS is configured, you can start all necessary services by running openvas-start. If you need to fix problems, you can use openvas-check-setup to identify the problem. Enter your browser 127.0.0.1 and accept the self-signed SSL certificate, then log in with the credentials for the administrator. The administrator password was generated during the setup phase (see the above issue if you missed it). You can customize the password for the user admin under "Administration => Users". Now OpenVAS is ready for the deployment to configure it and run a scan for a specific IP or range. Happy Vulnerability Scanning!